This year we were invited to participate in the 33rd Annual Asian American and Pacific Islander Heritage Festival hosted by the Coalition of Asian Pacific Americans. It took place Saturday, May 12th in the heart of DUMBO Brooklyn. It was a great change of pace for us as we've been working really hard preparing for the upcoming recording session. We kicked off the festival by marching through the main area towards the main stage performing Simple Gifts. Once on stage, we performed our parade routine without a hitch. It was actually the first performance for a few of our members too! They all did great. It's always an honor performing at events like these because it gives us a chance to perform for our community and show a bit of pride in our culture. The festival had an array of performers ranging from singers, to lion dancers, to Bollywood dancers! Next to the stage were a number of tables selling their baubles and delicacies. There was bubble tea, sushi rolls and even okinimiyaki being sold. The best part of the festival was the chance to meet and learn about other organizations that are reaching out to the Asian Pacific American community here in New York. It seemed like there were groups for just about any cause or interest. The Asian American Legal Defense and Education Fund, Asian American Arts Alliance, New York Asian Film Festival, Asian Women’s Giving Circle, CAAAV Organizing Asian Communities and the Rubin Museum of Art were just a few of the organizations present at the festival. After our performance, we were provided an area to promote the Crimson Kings a bit. Seated next to us were the NY Chinese Freemasons Athletic Club Lion Dance Troupe. During some down time, we had an impromptu jam session with them! 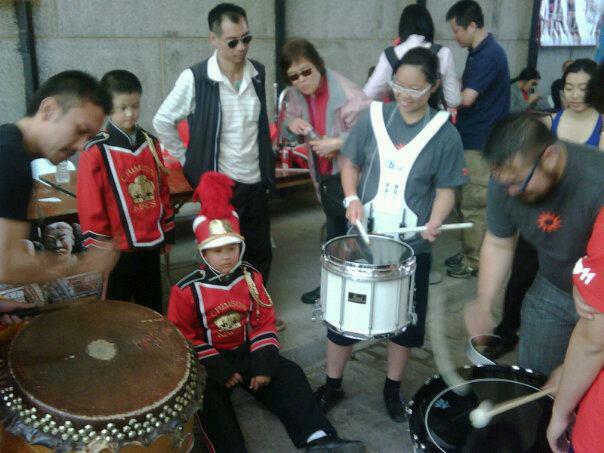 It was great mixing drum corps style drumming with traditional lion dance drumming. It definitely caught the attention and ears of all the festival goers! Don't worry if you missed it. We're planning on collaborating with them in the future. How awesome will that be? A drum, fife, bugle and lion corps! With all the noise we were making with the Freemasons, author Ed Lin even asked us to drum up (literally) a crowd for his reading! All the while this was going on, three of our members were interviewed by Nickelodeon! Stanley Chow-Brass Line, Jenny Li-Fife Line, and Justin Cheng-Drum Line will be a part of the upcoming Who Am I? Asian Pacific American And Proud May 27th special on Nick News. After heading back to the school, we ended the day with what else? Food. We went to 69 Bayard to feast a bit. Once all our bellies were nice and warm again, we left our mark by adding a Crimson Kings dollar to the impressive 69 Bayard dollar collection. It was definitely a great day.